As a child in the late 70s and early 80s, I used to play with three fox stoles that belonged to my mother. I was fascinated by their glass eyes and the clips that made ‘mouths’, and didn’t really consider any of it to be strange at the time. As an adult who’s been vegetarian for over twenty years, the very idea of a real fox stole – not to mention the sheepskin rugs that adorned each of the bedrooms in my parents’ house – horrifies me beyond words. Perhaps it was this sense of horror that pushed these recollections out of my mind for quite literally decades. But in the opening scenes of Penny Slinger, the film directed by Richard Kovitch, we see Penny walking down a stately driveway (Lilford Hall), draped in fur coat, accessorised by a fox stole, its beady artificial eyes looking fixedly over her shoulder toward the camera. This is our introduction to both Slinger and An Exorcism, the work which defined her career before her swift disappearance from the public eye for a very long time. There’s another personal preface I feel a certain obligation to include here: I first encountered Richard Kovitch in around, maybe, 2008, in the days of MySpace. Although now known as an award-wining director, Kovitch is something of a polyartist, and was writing – both fiction and essays – back then, and I had the privilege of including one of his stories, ‘For Reasons Unknown’ in the first Clinical, Brutal anthology in 2009. The story showcased Kovitch’s keen eye for both narrative and visual, something that’s common to much of his work, and the feature-length documentary Penny Slinger – Out Of The Shadows is no exception. The film is pitched as ‘the incredible, untold story of the British artist Penny Slinger and the traumatic events that led to the creation of her masterpiece, the 1977 photo-romance, An Exorcism’. Much of the story is told by Slinger herself, who proves to be a remarkably cogent and articulate speaker. The documentary notably features contributions from Peter Whitehead (who collaborated with Slinger on the shooting of An Exorcism at Lilford Hall in 1969, and it’s footage from this which opens the film) and Michael Bracewell, amongst others, and the ‘talking heads’ segments are comfortably paced and helpfully cut with pieces of Penny’s work in a way that satisfies both the well-versed and uninitiated. Ultimately, it’s most notable for its well-structured narrative. And its soundtrack. 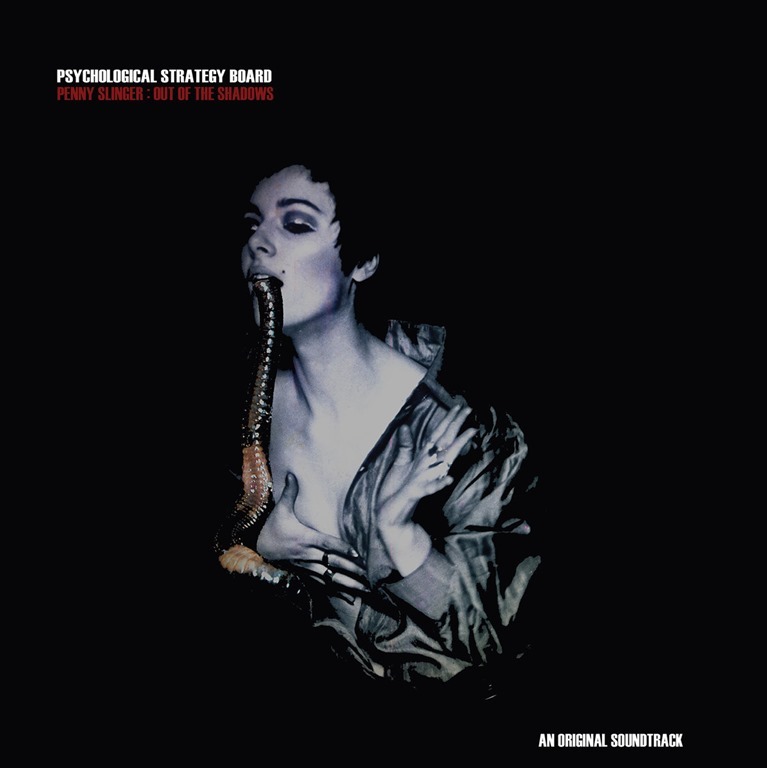 The soundtrack in question is the debut album for Psychological Strategy Board. Taking their name from the committee responsible for overseeing strategies of psychological warfare in the US in the 1950s, it’s perhaps appropriate that biographical details about them is scant, beyond the fact Maybury and Paul Snowdon are perhaps better known as johnny mugwump and Time Attendant respectively, and that their only previous release is an EP, also released on Front & Follow, back in 2012. That. And the fact that the creation of this soundtrack, which began in 2011, was a challenging experience, both musically and personally. In context, it isn’t entirely surprising. As it transpires, their near-invisibility proves to be something of an asset, as well as an indication of their modus operandi: while the soundtrack – released on vinyl and download split into thirteen tracks – is a continuous presence throughout the film’s one hour and thirty-three-minute duration – and very much steers the mood and accentuates the atmosphere, particularly when accompanying the more dramatic shots or narrative moments, it’s subtle in its delivery. Within the context of the film, it works well. The measure of a soundtrack’s quality is whether or not it succeeds on its own merit, as a musical work, when separated from the film it was designed to accompany. This does, not least of all because it’s a largely ambient work which conjures image and feelings – often of disquiet -that any ambient work of a darker persuasion might. Dank rumblings and slow churns reminiscent of Throbbing Gristle nudge against hovering dissonance and creeping fear chords. Spurts of electronic dislocation bubble and fizz over thick ripples of amorphous, atonal synth sound, hissing static and whispering winds. Sonorous low-end notes resonate, hanging in the air before they slowly decay, submerged by tense undulations. The atmosphere is dark, ominous, unsettling, but not oppressive. And while the narrative of the documentary and the creative process which yielded the supremely surreal and highly sexual An Exorcism is not – and never could be – conveyed in musical form, the otherness of the work itself very much is.